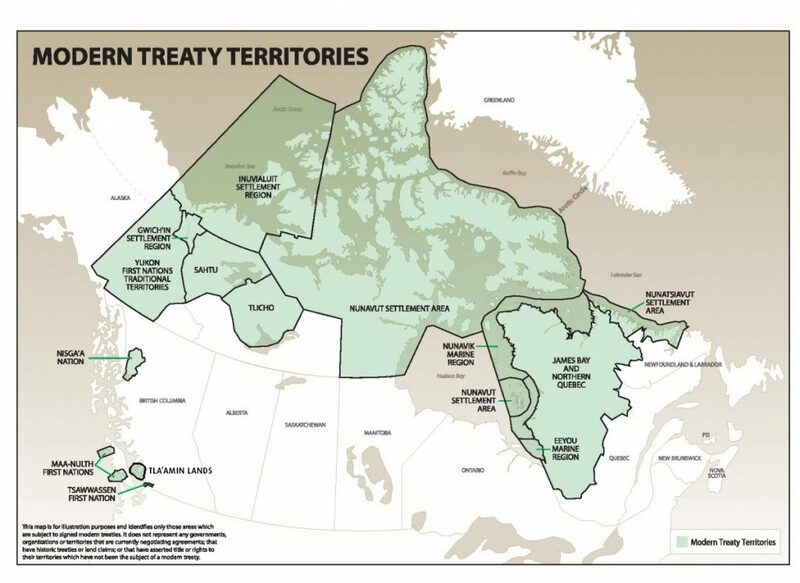 Modern treaties are reshaping Canada. Since 1975, the federal government and Indigenous communities have entered into 26 of these comprehensive land claim agreements, covering parts of all three territories and four provinces. Modern treaties have provided Indigenous ownership over 600,000 km2 of land and capital transfers of over $3.2 billion, but they are not just real estate or cash transactions. They also establish new relationships between signatories around resource development, wildlife and fisheries management, education, health services, and more. As some of the treaties currently in negotiation become finalized—as of August 2016, there are nearly 100 tables open across the country—the existing map of modern treaties will become a vestige in Canada’s evolution. Modern Treaty Territories in Canada in 2009. Nearly half of Canada’s lands and waters are in some way impacted by these comprehensive land claim agreements. Reproduced with permission of the Land Claims Agreement Coalition. We are not interested here in continuing the argument for why modern treaties deserve our attention. Scholars in and outside academia have already made the case. Rather, we use this post to invite historians to consider two other questions, both of which shape how we translate that attention into action. Who is the audience for research on modern treaties? What are the routes and roadblocks in the modern treaties archive? We hope our answers inspire more collaborative and engaged research on one of Canada’s most transformative, yet unfinished episodes. Who is the audience for research on modern treaties? Our answer to this question was made clear during a recent conference hosted by the Land Claims Agreement Coalition (LCAC), a group of more than 15 Indigenous organizations working together to ensure full implementation of modern treaties. The LCAC invited academics to Ottawa for a three-day meeting in December 2015 to shape the future of research on comprehensive land claim agreements. The four of us attended separately, representing different backgrounds—consultants and legal negotiators for a treaty-implementation organization (Nunavut Tunngavik Inc.); a graduate student in Common Law at the University of Ottawa; and a historian studying the environmental regimes created by modern treaties in the North American Arctic. But we found common ground when we heard members of the LCAC explicitly ask for more nuanced historical accounts of modern treaties. These members desired a different history for civil servants charged with implementation, so these federal employees would better understand the significance of that task. It is no surprise that the Government of Canada has an uneven track record on carrying out its responsibilities as regards treaties. What we want historians to notice here is the direct line drawn from historical context through contemporary Indigenous policy to continued progress on reconciliation. Indigenous leaders at the conference—representing villages, regional bodies, and national organizations—underscored their hard work in documenting Indigenous experiences in negotiating treaties. They wanted help from historians to examine the federal sides of those histories, in part because the people now in the position of shaping federal-Indigenous relations know very little about what has come before. What are the routes and roadblocks in the modern treaties archive? For the historian ready to pursue this kind of research on modern treaties, much groundwork has been laid down over the past forty years. Political scientists interested in Indigenous law and lawyers for Indigenous organizations have used academic journals and edited volumes to shape political discourse around comprehensive land claim agreements. Their work often provides a blow-by-blow of decisive court cases on Indigenous rights and Aboriginal title. Much of this literature has focused on the territorial north, where the initial development of modern treaties concentrated. While useful, this scholarship is no substitute for materials that come directly from employees of the Government of Canada, higher-ups in the relevant departments and agencies, elected officials, and Cabinet members. We have each spent time looking for these documents and seeking access to them, which has revealed some promising routes and frustrating roadblocks. By sharing these experiences, we hope to smooth the way forward for our colleagues and advance the historical project recommended by members of the Land Claims Agreement Coalition. First, the roadblocks. An ideal source would be Memoranda to Cabinet submitted by the Department of Indigenous and Northern Affairs (alternatively, given the period under study, the Department of Indian and Northern Affairs) on behalf of the federal negotiating team seeking approval for provisions of any modern treaty. These memoranda also often refer to Cabinet Documents that provide deeper analysis of and rationale for particular sections of treaties, especially if a new precedent is to be set (on participation in resource management boards, for example). There is probably no other type of source that provides a richer cross-section of modern treaties across time and Canada’s various federal departments. The problem for historians is that the Privy Council Office (PCO) does not transfer these materials to Library and Archives Canada (LAC) until 30 years after their creation. Even more, under the Harper administration, the PCO did not consistently transfer these materials. The result is that, as of today, the LAC database on Cabinet materials is not reliable after 1976, when all but one of the existing modern treaties were finalized. The files of Ministers of line departments at the LAC. This is definitely a fishing trip, with no promises of catching anything. But, in some cases, Ministers kept final and draft copies of Memoranda to Cabinet in their records, and these are available at the LAC. The files of the Department of Indigenous and Northern Affairs at the LAC. These materials are notoriously complex and difficult to search comprehensively. But the LAC does have many boxes on the Claims Sector and its predecessor, the Office of Native Claims. The personal records of chief federal negotiators. These may become available in time as these individuals entrust their records with local, regional, or national archives in Canada. 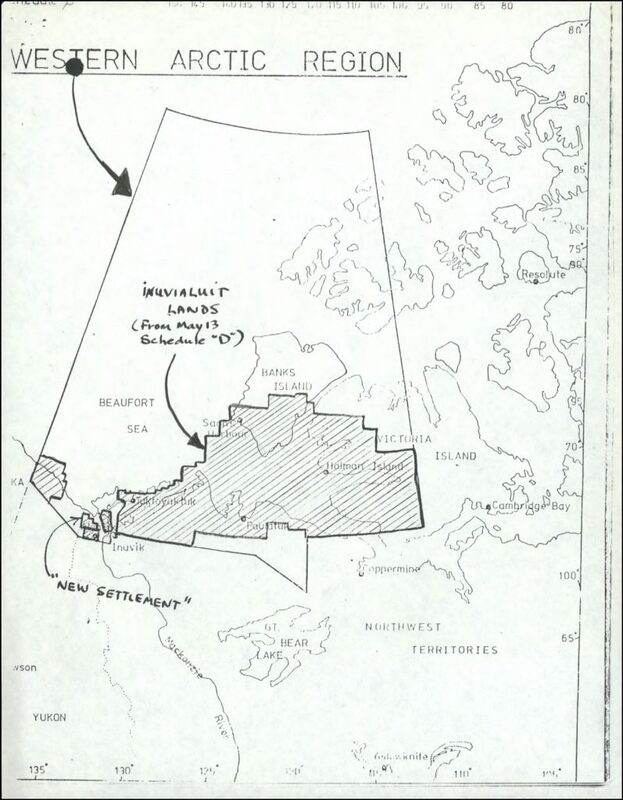 For the Inuvialuit Final Agreement (1984)—the first north of 60, and only the second in the country—the records of federal negotiator Simon Reisman (1981-1984) are now open to researchers. Federal employees and elected officials. Given how recent, and ongoing, the process of modern treaties is, many of the individuals involved in developing federal positions on land claims negotiations are still living. Some are still working for the Government of Canada. An oral history project would go some length to helping record and preserve these experiences. Ultimately, our hope in suggesting how we might research modern treaty history—rather than explicating why it should be researched—is to build energy for a particular scholarly agenda. Surely there are historians who already interrogate the federal roles in modern treaties and treat their writing as an intervention in contemporary politics. Perhaps there are other scholars who are considering embarking on these kinds of projects. In closing, we invite you to join us in imagining and creating research on modern treaties that raises the awareness of these complex, dynamic agreements among an audience of federal implementers, for the benefit of current and future Aboriginal signatories. We want to hear from you: in what form or forum can we best work together to tell the history of modern treaties in this way? Andrew Stuhl is an Assistant Professor of Environmental Studies at Bucknell University (Lewisburg, PA). His book, Unfreezing the Arctic: Science, Colonialism, and the Transformation of Inuit Lands will be published by the University of Chicago Press in November, 2016. Anna Logie is a Juris Doctor student at the University of Ottawa. For the past 3 years, she has worked for a variety of Indigenous governments and organizations in non-treaty, historic treaty and modern treaty contexts. Bruce Uviluq is a 2017 Common Law Juris Doctor candidate at the University of Ottawa on educational leave from Nunavut Tunngavik Inc. where he has worked since 2002 primarily in negotiations representing Inuit against the federal government. Derek Rasmussen is a graduate student at Simon Fraser University and does legal and policy research for Indigenous organizations. For the past 9 years he did research for a lawsuit brought by the Inuit group Nunavut Tunngavik Inc against Canada for non-implementation of the Nunavut Land Claim Agreement (1993). Although both the Access to Information Act and the Privacy Act (ATIP) permit access to Cabinet records after 20 years, the records are retained for up to 30 years by the PCO, as many have ongoing operational value.